The number of carbon monoxide detectors required in your home will depend on several factors. You’ll need to take into account the size of your home and the number of bedrooms. It is very common for homeowners to not place carbon monoxide detectors correctly, so it’s very important you follow all manufacturer recommendations. However, the CPSC does not recommend the placement of carbon monoxide detectors in the attics of a home. Another area to place a carbon monoxide detector is nearby an attached garage, but it’s important to know the difference between carbon monoxide and carbon dioxide. Within the garage, vehicles can produce dangerous chemicals that can seep into the house. If you’re ever unsure of whether or not you need an alarm in a particular area, err on the side of caution. Carbon monoxides are not a major expense and you’re better off purchasing extras. One thing to keep in mind is that you will place a carbon monoxide detector at a different level than a smoke detector. Smoke detectors are typically placed on ceilings because heat rises. Carbon monoxide mixes in with fresh air. 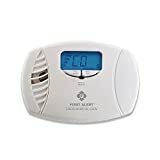 You may want to place them level with your bed since you’re most vulnerable to carbon monoxide poisoning when you’re sleeping. If you have children who may be curious about the detector, you can set it higher on the wall at eye level. 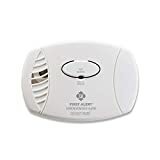 Although you want to place a carbon monoxide detector within the general area of an appliance burning fossil fuels, it should still be a minimum of 15 feet away from the unit. You’ll also want to keep the detectors out of reach of children to avoid any malfunctions. Many manufacturers offer combination detectors for smoke and carbon monoxide. You’ll want to place these in the same areas as carbon monoxide detectors. Although these models are more expensive, they will require less annual maintenance. The price will also be determined by what type of features you include. For instance, if you want a long-lasting battery, you’ll pay more for a type with a 10-year lithium battery. You may also pay more if the detectors offer voice alerts or have wireless interconnected capabilities. 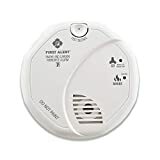 The way interconnected detectors work is that when one alarm goes off, all others in the residence will sound the alarm too. The least expensive types will be battery operated and require monthly testing and semi-annual battery replacement. Many homeowners like to change the batteries during daylight savings in the fall and spring. Interested in home security including monitored smoke and carbon monoxide detectors? Contact Protect America today to find out more about their affordable equipment pieces and home security plans. Request a free online quote through their secure web portal.